Behold the ‘Ring of Fire’! 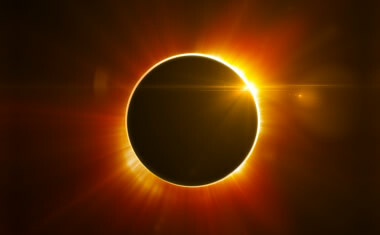 Today’s solar eclipse (May 20, 2012) marks a new beginning! Today is ‘the ring of fire’ new moon solar eclipse! Are you ready? Ready or not eclipses have the power to literally ‘eclipse out’ things in your life that no longer serve you, freeing up your valuable time and energy. They also mark the beginning of something new. Today is a great day to clear the fog, re-gain your footing, set new intentions, create new opportunities and open your mind to limitless possibilities! Everyone is being affected by this particular cosmic event and it may feel like you are on information overload. While I am not an astrologer I do read energy and in the days leading up to this particular eclipse I’ve been contacted by many who are experiencing disturbing dreams and unfounded fears as well as a seemingly abrupt awakening. The truth is showing itself and it can be unnerving and disconcerting when it does. Since an eclipse is always about endings and beginnings you may find clarity about past events and you may decide to embark upon a new path. With every “step up” comes a letting go and there is a grieving process which is a natural part of the process. As you find clarity during this powerful time the answers you seek and those people or situations which are not in alignment with your path will become obvious. An eclipse will magnify and in essence show you the ‘cracks’ (and what seeped into those cracks) in your foundation. This is a great time to end those chapters of your life (resolve issues or agreements from the past), fill in and seal up the cracks (with love and forgiveness for yourself and others), and allow the power of the eclipse to propel you forward into your new beginning! Clarity is not only about seeing what has passed so you can resolve past issues. It is about seeing with clarity those things you wish to create. Having a clear picture of where you want to go and what you want to do helps you build a foundation for the future and there is no better time than today to harness the power of the eclipse to help you do that! Previous Post Does Fear Hold you Hostage? Please stay inside during the eclipse as the energy of an eclipse certainly ends cycles but uses the destructive methods causing problems and end results that are thrust on you and throughout history have always been bad especially directly in the eclipse path -Taiwan -South Japan – LA – Alberquerque. I’m in Chicago and I’m watching closely what happens with the protests going on here because of the NATO summit. Indeed it is a powerful day!